They say if you love something, set it free. That’s what I am doing with the Oxford comma. Just a refresher: the Oxford comma, also called the series comma or the serial comma, is the comma used immediately before a grammatical conjunction—such as and or or—preceding the final item in a list of three or more items. For example, a list of three fruits can be punctuated as either “apples, oranges, and bananas” (with the Oxford comma) or “apples, oranges and bananas” (without the Oxford comma). I don’t know for certain, but I suspect the Oxford comma made its way into accepted practice around the mid-1960s. At least that’s the time I began writing sentences. I must have been right on the cusp, so I’ve always used the comma. I do know those older than I eschew it. My father is horrified by an Oxford comma. My brother, eight years my junior and an accomplished public relations executive, uses it. The attitude of some much younger may best be expressed in a 2008 song by the group Vampire Weekend, called “Who Gives a F*** About an Oxford Comma?” In general, older writers don’t like the comma, younger ones do and the youngest ones may not really care. That’s a subject for another day (but let it be noted that I have some faithful readers who are under 25 and keenly attuned to such matters). Whether or not an Oxford comma is correct truly depends upon which authority you consult. Nevertheless, a wise wordmistress reminded me just recently that consistency is what’s more important. Either way, this year I’ve made a definitive choice. Perhaps it is a desire to return to a cleaner, simpler way of life. I am making a conscious shift and ditching the Oxford comma. No ifs, ands or buts. Ne’er. I am married to the Oxford comma. Just because I said so! Lovingly, your mother. My office partner and I edit each other’s stuff. He leaves it in, I leave it out. Hey Monica! I have not seen you in many years, but I hear about you all the time from my mom and Butch and Lou. Marty recently shared your blog with me and I love it! 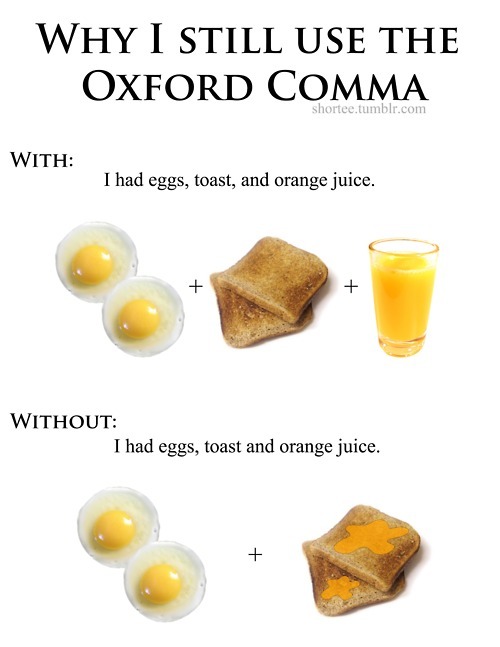 I would like you to know that with regards to the oxford comma, I remember always being given the choice in whether or not I want to use it when I was in shcool. I, feeling the need for the simple life myself, have never liked it. I’m totally with you on your decision in ditching it. Good for you! I am a tad older than you and have never used the Oxford Comma. It was not included in my grammer classes. Honestly, until this blog I did not realize it was ever considered correct. I just assumed the writer did not know the “and” meant the comma was not required. Learn something new every day. Even at my old age!! Reading this brought cold shivers down my back, reminding me of my high school creative writing class. Give me a pen, a sheet of paper, and I was off to the races creating literary masterpieces (okay, so I’m embellishing just a wee bit). I would consistently receive an “A” for my creative genius and an “F+” (no kidding) for not knowing who this Oxford guy was and why teachers kept telling me to break up my beautiful sentences. Many years of therapy and a “business grammar” course later, I still break out into a sweat: To comma or not to comma – is that the real question? Could it be used as a pick-up line at a bar: “Hey, do you want to see my comma”? I have lived in fear for 30 years that the comma police will give me an “F+” if I don’t obey their rules. So I will continue to use, abuse and hope that those who “don’t” will understand I’m a product of my public school education. In conclusion (you won’t believe this), my husband and I just got into a heated argument over what the Oxford comma is – or isn’t! YES! At Kenyon I spent 3 hours every week tutoring at the writing center crossing it out of people’s papers. Thank you for just saying no. As an LP (language professional), I have a question of localized grammar. I feel that it should be “than me” because “I/me” is not the subject of the verb “eschew”, but I listen to American podcasts a lot (I was born in South Africa – i.e. more UK-oriented) and notice that “than I” (or “Katie spoke to David and I”) seems to be used frequently. Is this common practice in the USA? Thanks for writing, Eugen. My understanding has always been that it is “I,” as in “those older than I am,” with “am” being implied. They are taller than we [are], and so forth. I consulted another LP for guidance and found a lenthy discussion about whether “than” is a conjunction or a preposition. She says conjuntionists and prepositionists disagree on whether a subjective or objective pronoun should be used. Read http://grammar.quickanddirtytips.com/than-I-versus-than-me.aspx and notice that she says that both “I” and “me” are correct, but that they have different meanings. I hadn’t thought of it as a regional practice. By the way, “Katie spoke to David and I” is just plain wrong, no matter the region, though, sadly, I am not surprised to know you hear it a lot on American podcasts.